More than 14,000 trees, plants, and shrubs from various parts of the world that make up the Arboretum's "living collection." Ever since this 265-acre (107-hectare) park was given to the city by Harvard University, Bostonians have been coming here to the Jamaica Plain district (map) to enjoy the peacefulness of the park and its vast collection of trees and plants. Spring is the best time to catch the first blossoms like the lilacs at the Arboretum, but in fact anytime is a good time. There's lots to see. Early summer brings the rhododendrons, and all through the warm months the scents here will bring back any nose dulled by the city air. Designed by Charles Sprague Sargent and Frederick Law Olmsted, the Arboretum is a significant link in Olmsted's Emerald Necklace chain of parks and green spaces extending from Boston Common seven miles (11 km) to the Arboretum. 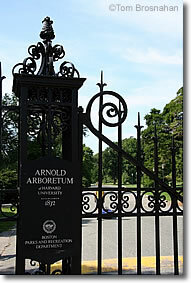 Arnold Arboretum is maintained jointly by the Boston Parks and Recreation Department and by Harvard, which uses it as an open-air classroom in botany. The Arnold Arboretum is open daily from dawn to dusk. Take an Orange Line subway train to Forest Hills, or a Green Line train to Arborway (the Orange Line's probably faster). If you drive, you can often find parking near the Arboretum's gates, but observe the signs that caution you to lock your car and to leave no valuables in it—particularly not within sight. Gate to the Arnold Arboretum, Boston MA.